I know you are thinking. You are thinking that the end of summer is an odd time for a detox. I mean, you are supposed to do this kind of thing after the holidays or vacation, right? Well, first of all, I’m not doing an intense detox – just trying to eat super healthy for a week or two. And, second, I have done all the wrong things with my healthy summer food. I’ve made blackberries and tomatoes into pies, peaches into bars, fried okra or smothered it with cheese, made blueberries into pancakes, and put cream and fat into corn. And, now I really need something healthy! The great news is that healthy can be delicious. 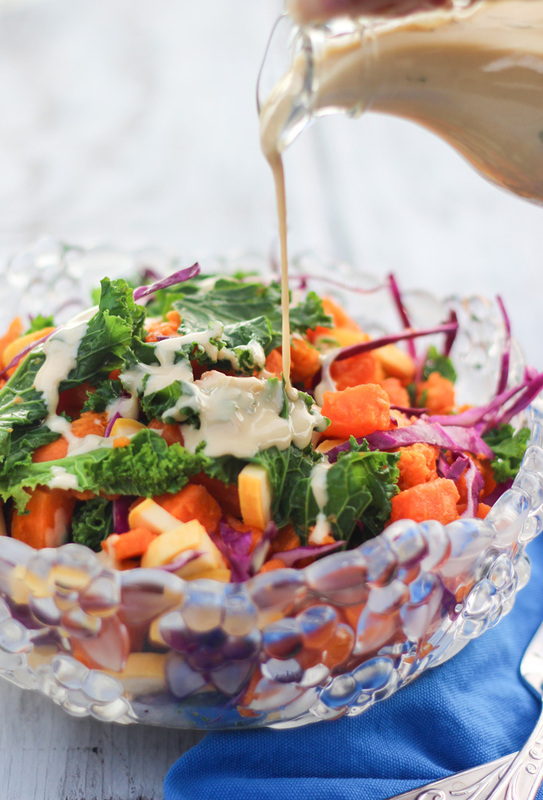 So, I made this salad with kale, sweet potatoes, squash, and red cabbage and topped it with the best lemon tahini dressing ever. Seriously, I could drink this dressing right by itself. But, that is ok because it is good for you, and it is really good with the vegetables. I couldn’t decide which photo of the dressing I liked best, so I put two. You know, dressing and more dressing. Hey, your lucky I didn’t put more. I really, really like it. Can you tell? And, then toss it together with the vegetables, and your done. Actually, even though it is a really easy recipe, it is not quite that easy because some of the vegetable require cooking and cooling. Of course, if you want to add the dressing to all raw vegetables, it would speed it up, and I think you will like the dressing on almost any vegetable. Bake sweet potatoes until tender. Allow to cool enough to handle and then dice. Refrigerate until cold. Add the kale to the water just until it turns bright green (about 1 minute). Drain. Combine all vegetables, adding the sweet potatoes last and being careful not to mash them. Whisk together remaining ingredients until well combined. Pour over the vegetables and toss to coat. 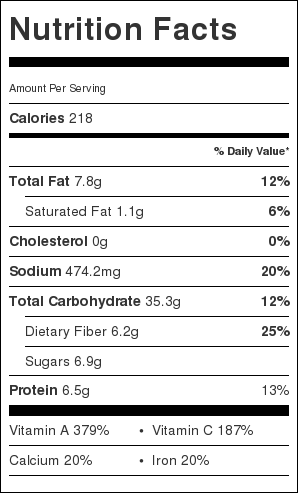 I am also experimenting with adding nutrition facts. I don’t think I will be brave enough to add them to all of my recipes because, you know, it is just hard to make something look good…like cake…on a nutrition label, but it is great for this. This is figured on six servings. Let me know what you think. 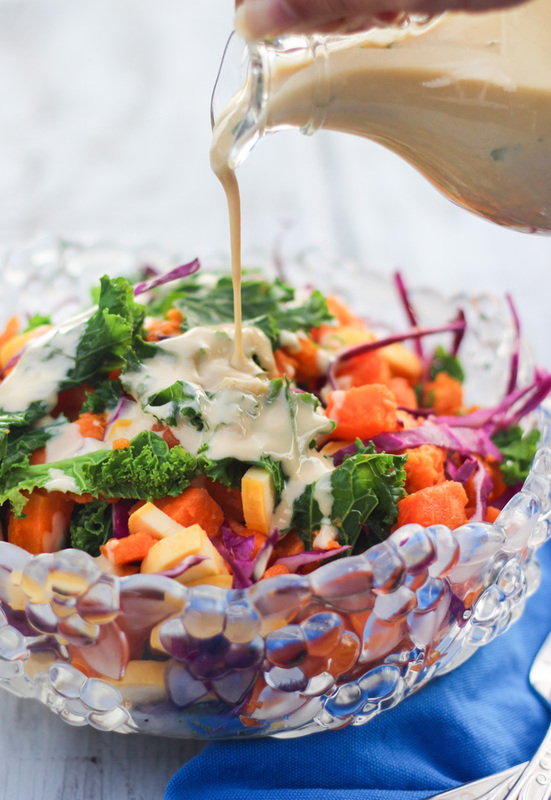 It you like tahini dressings, you will love this! love coming across new salad ideas to add to my weeknight notation. thanks for the recipe and idea, definitely will be recreating this in my kitchen! 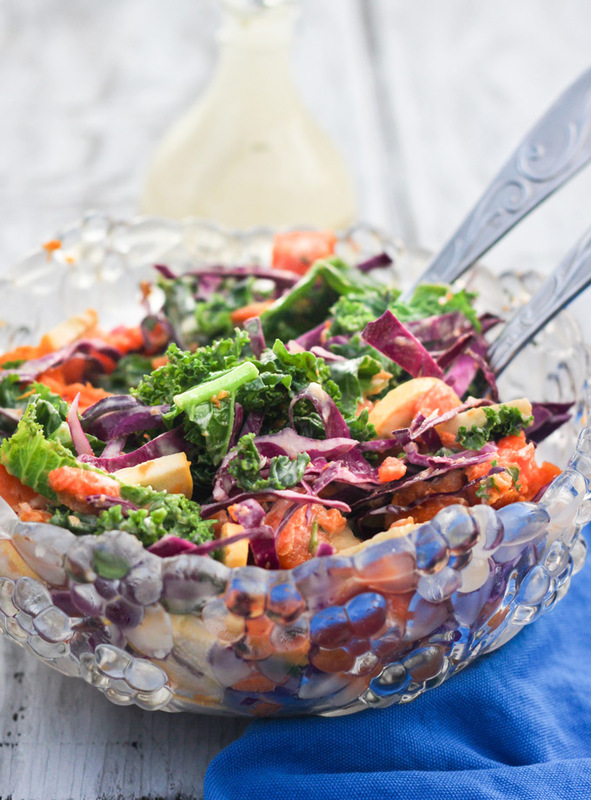 This is a delicious Detox Salad, I would have this anytime. I also love the dressing, it sounds so good. Pinned/shared. Wow, a stunning photo display of such an incredible tasting salad. Yes,please, I will have some.